It is the first time the festival has sold out before any acts were announced. People pictured at last year's festival. TICKETS FOR HEADLINE Irish music festival Electric Picnic completely sold out this morning, just 15 minutes after going on sale. 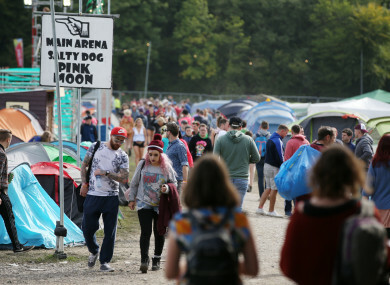 Electric Picnic – which will be held for the 15th consecutive year in 2019 in Stradbally, Co Laois – is the biggest and most popular Irish music festival, usually taking place in the first week of September and rounding off the summer. This is the first year that it has completely sold out before any music acts were announced. “For the first time ever in the festival’s 15 year history, tickets sold out months in advance of the line-up being revealed, which is testament to the enduring popularity of Ireland’s biggest music and arts festival,” a spokesperson said in a statement. Originally seen as a more chilled out, adult alternative to the more popular and hectic festivals of the time (Oxegen, anyone? ), Electric Picnic has grown hugely in popularity over the last number of years. It now has a capacity of over 50,000 people and has featured such top name acts as Kendrick Lamar, LCD Soundsystem, Underworld and the Chemical Brothers (among many others). Organisers say that the line up will be announced in the new year. Email “Electric Picnic tickets sell out 15 minutes after going on sale”. Feedback on “Electric Picnic tickets sell out 15 minutes after going on sale”.